Could Venezuela surpass Saudi Arabia as the top oil-producer in the world? Geologists at the earth science think-tank, the U.S. Geological Survey (USGS), have made just such an assessment. Scientists there claim that the Orinoco belt region in Venezuela may have the potential to yeild 800 billion barrels of oil – approximately twice the amount the area was originally thought to hold. The Orinoco oil belt is located on the southernmost strip of Venezuela’s eastern Orinoco River basin. Could Venezuela surpass Saudi Arabia as the top oil-producer in the world? Geologists at the earth science think-tank, the U.S. Geological Survey (USGS), have made just such an assessment. Scientists there claim that the Orinoco belt region in Venezuela may have the potential to yeild 800 billion barrels of oil – approximately twice the amount the area was originally thought to hold. The Orinoco oil belt is located on the southernmost strip of Venezuela’s eastern Orinoco River basin. To date, the largest proven, conventional oil reserves are those of Saudi Arabia estimated at 260 billion barrels. The tar sand reserves of the Orinoco belt are estimated to be the largest unconventional oil reserves on earth at 1,200 billion potential barrels. The second largest tar sand region is located in Alberta, Canada, and is contributing considerable revenue to the Canadian economy. The USGS study verifies that through the use of high-tech equipment, their probing concludes the petroleum underground at the Orinoco site is substantially more than was originally thought – but is that oil recoverable? Most major new oil finds – such as the Shoonabeeke well in the Netherlands, and the deep sea waters off the coasts of Brazil, West Africa, and the U.S. – offer the overall assessment, and then more realistic numbers related to how much of the potential find is actually reachable for recovery. In an article, in the October 2009 issue of Scientific American, Leonardo Maugeri predicts that the newest technological breakthroughs will boost today’s oil recovery rates from around 35% to perhaps better than 50% by the year 2030. Thick rock formations and the heavy, molasses-like consistency of deeply embedded oil lowers the potential that it is minable. 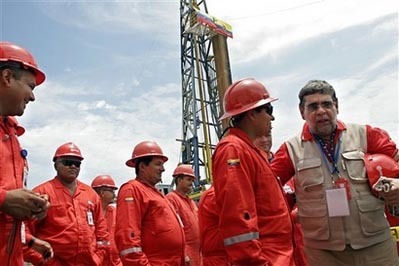 The Petroleos de Venezuela S.A. (PDVSA), its oil agency, ventures that of the oil reserves located in the tar-sands of the Orinoco belt, perhaps 215 billion barrels are termed ‘producible’. The USGS has updated that estimate to 513 billion. Today, with energy conservation an international concern, and reduced consumption in the U.S. and other nations attempting to possibly stretch the world’s oil supply, should governments worry about running out of petroleum? Mr Maugeri, a senior vice-president of Italian energy company ENI, suggests, “If my estimates are correct, we [the world]will have oil for the rest of the twenty-first century.”The Orinoco belt is a reserve in southeastern Venezuela that holds billions of barrels of heavy, tar-like oil that can be upgraded into lighter, more valuable crude.